The agriculture ministry has claimed that in the first year of Prime Minister Narendra Modi’s term, it launched several new initiatives, such as soil-fertility boosting neem-coated urea and soil-health cards, Pradhan Mantri Krishi Sinchai Yojana (PMKSY), Paramparagat Krishi Vikas Yojana (PKVY) and Deen Dayal Upadhyay Gram Jyoti Yojana (DDUGY). Factchecker found that these are renamed versions of existing schemes. While the government has claimed significant increase in funds for farm credit, PMKSY and PKVY, the data reveal a different story. Claim: The Prime Minister said the current government took a strategic decision to begin production of neem-coated urea to boost the falling fertility of India’s over-fertilised agricultural lands. Reality: Parliamentary data reveal that urea, along with various pesticides, has been coated with neem for 11 years. Claim: The Prime Minister has implied that issuing “soil-health cards” is an original idea of the National Democratic Alliance (NDA) government. Reality: More than 50 million soil-health cards had been issued to farmers across states and union territories by March 2012. In 2008-09, the then-government had launched a National Project on Management of Soil Health and Fertility to test farm soils and encourage proper use of fertilisers to boost soil health and productivity. Claim: Farm credit target raised to Rs 8.5 lakh crore. This was a key achievement during 2014-15. Reality: An examination of government data since 2010-11 reveals that farm-credit targets are raised by at least Rs 1 lakh crore every year. The target for 2014-15 was fixed at Rs 8 lakh crore. So, the target of Rs 8.5 lakh crore for 2015-16 is an increase of Rs 50,000 crore, which is the smallest increase over the past five financial years since 2010-11. Claim: Deen Dayal Upadhyay Gram Jyoti Yojana (DDUGY), (Deen Dayal Upadhyay Rural Electrification Programme), launched for rural electrification; a “key initiative”. Reality: DDUGJY is the new name for Rajiv Gandhi Grameen Vidyutikaran Yojana (RGGVY). Or as the Government informed Parliament: “RGGVY has been subsumed [under] DDUGJY in December 2014”. As many as 112,287 villages previously without electricity were connected to the grid under RGGVY during the 10th (2002-07) and 11th (2007-12) plans. Under the 12th plan, the target was to electrify 12,468 un-electrified villages (UEVs), intensive electrification (IEV) of 0.2 million electrified villages and free electricity to 13.3 million below poverty line (BPL) households, including those in scheduled-caste and scheduled-tribe areas, at a cost of Rs 23,709 crore. 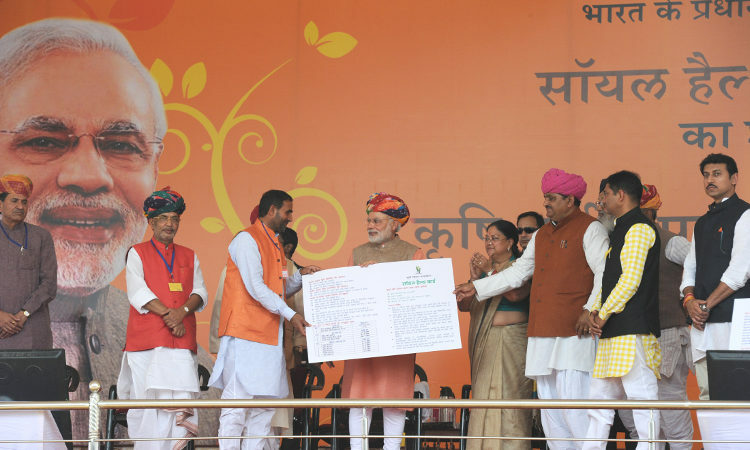 Claim: Pradhan Mantri Krishi Sinchai Yojana (PMKSY), or Prime Minister’s Irrigation Programme, launched to ensure universal access to irrigation. Reality: PMKSY is a revamped (if not simply renamed) version of the Accelerated Irrigation Benefits Programme (AIBP), launched during the 11th Plan (2007-2012). It finances chosen unfinished irrigation projects. A total of 297 major- and medium-irrigation projects and 16,769 minor-irrigation projects received central assistance under the AIBP till March 2014. Out of these, 143 major and medium projects and 12,495 minor projects have been completed. Rs 67,477 crore was given by New Delhi to various states, and a total irrigation potential of 9.4 million hectares been created. The allocation for AIBP during the 11th Plan was more than Rs 50,000 crore; it is Rs 1,800 crore for the PMKSY over 2015-16. Claim: Launched Paramparagat Krishi Vikas Yojna (PKVY), Traditional Agriculture Growth Programme, to promote organic farming; every farmer to get Rs 20,000 per acre every three years. Reality: PKVY is, again, an example of change in nomenclature; it clubs existing organic-farming schemes/programmes. These schemes and programs have been under implementation through the 10th, 11th and now the 12th Plan. You can read the introductory piece of this series here. MeanWhile the saffron brigade terms you as anti- national.